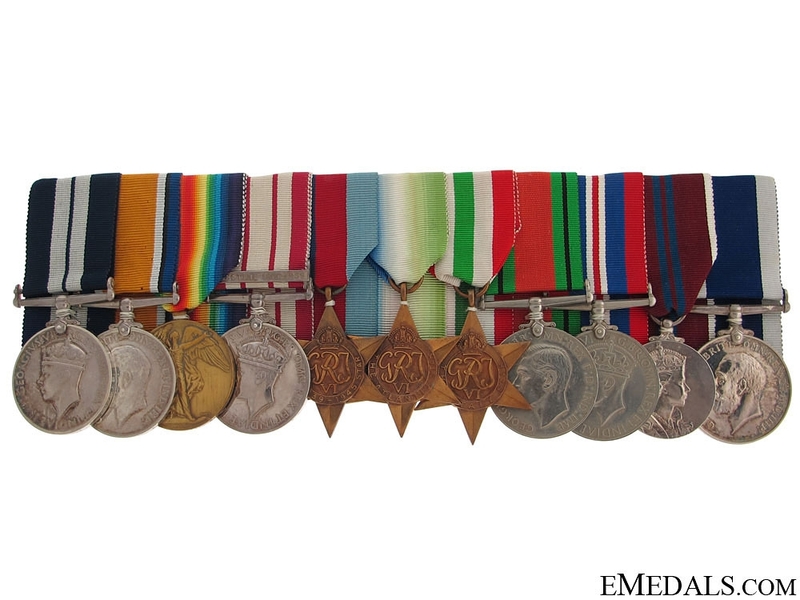 The Awards of J.R. Melrose - Anzic landings DSM - Distinguished Service Medal, George VI (P.O. TEL. J.R. MELROSE. P/J. 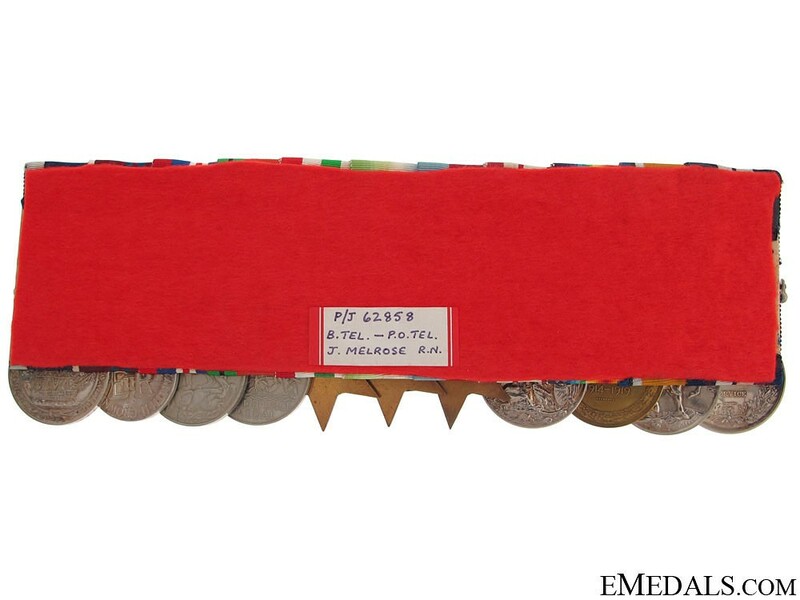 62858); British War and Victory Medals (J. 62858 J. MELROSE. B. TEL. R.N. ); Naval General Servce Medal, George VI, 1 Clasp - PALESTINE (J. 62858 J.R. MELROSE. L. TEL. R.N. 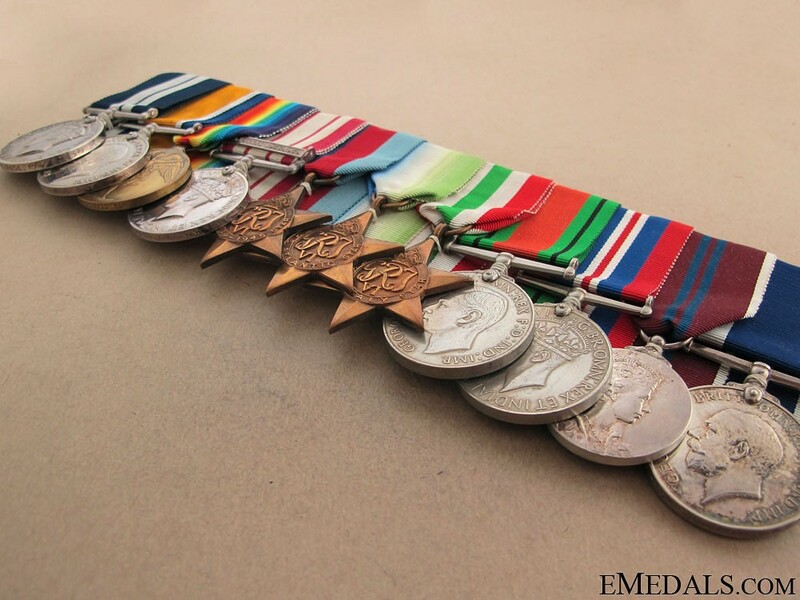 ); 1939-1945 Star; Atlantic Star; Italy Star; Defence Medal; War Medal 1939-1945; Coronation Medal 1953; and Royal Naval Long Service and Good Conduct Medal, George V (J. 62858 J.R. MELROSE. L.TEL. H.M.S. GREENWICH.). Naming is privately engraved on the DSM, while the BWM, VM, NGSM and RNLSGC are officially impressed. Extremely fine condition, board mounted. 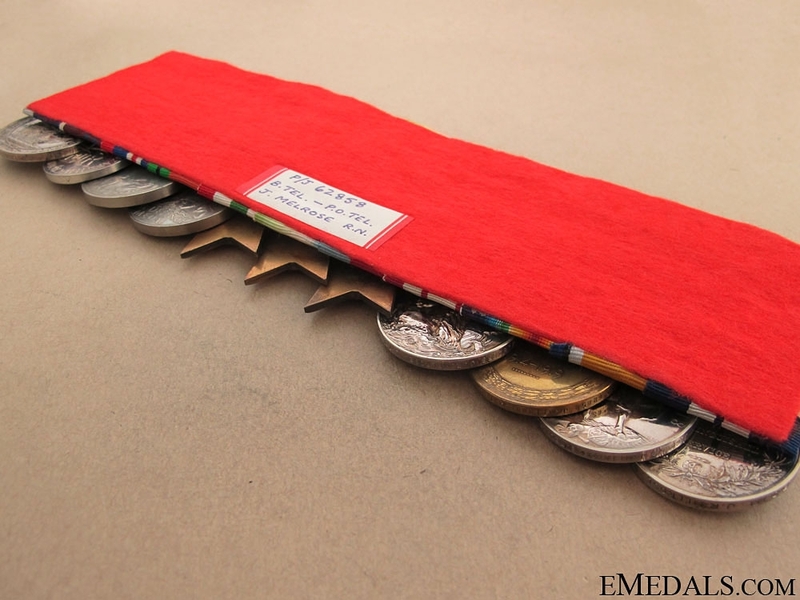 Also included is a duotang folder with his military biography, an Admiralty DSM commendation letter, a letter from Buckingham Palace authorizing him to wear the Coronation Medal and a photograph of H.M.S. Greenwich. Footnote: James Russell Melrose was born in 1903 in Edinburgh, Scotland and joined the Royal Navy as a Boy Telegraphist in 1918 at the age of fifteen. It is unclear as to what ships he served,as that information is still classed as privileged information. The Royal Navy admitted many boys from age fifteen, who served on navy ships in war zones. Time spent as a boy seaman did not count towards the fifteen years required to earn the RNLSGC Medal, which he must have earned in 1935-1936, as a Leading Telegraphist. He earned his NGSM in Palestine, while serving from 1936-1939, as his ship provided men to guard facilities, when the Grand Mufti (Palestinian Arab Leader) forces and the Jewish population were engaged in conflict. During WWII, he saw considerable service in the Atlantic escorting convoys. The Italy Star was for his service after the capture of Pantellaria on June 11, 1943, along with service in Sicily, Italy, Greece and Yugoslavia. He was awarded the DSM on June 30, 1944 by the Admiralty. As there is no citation, his act of gallantry possibly took place at or during the Anzic landings after January 22, 1944. He was listed in the London Gazette on June 8, 1944 as being retired on pension. On the Coronation of Her Majesty Queen Elizabeth on June 2, 1953, he was retired from the Royal Navy and as a civilian, awarded the Coronation Medal.